They can't all be great folks. The latest Star Wars Rebels episode Iron Squadron marks the first weak episode of season three. New characters are introduced, so this may purely be a set-up for a more detailed storyline. Our heroes meet a band of spunky teens fighting the Empire. It's also the first time that Phoenix Squadron's Commander Sato (Keone Young) gets a whiff of their real adversary, Grand Admiral Thrawn (Lars Mikkelson). Foundations were laid, but the overall entertainment value of this installment was lacking. The Ghost and a small group of rebel ships arrive at Mykapo. The planet is about to be invaded. They are there to facilitate the evacuation. Hera (Vanessa Marshall) watches as on old YT-2400 freighter attacks TIE Fighters and a light cruiser. She radios for the ship to disengage or be destroyed, but gets a youthful, chirpy response. Iron Squadron doesn't back down and doesn't need your help. Ezra (Taylor Gray) informs Commander Sato of the developments. He posits that Iron Squadron was led by his late brother; his long-lost nephew must be there leader. Hera commands Zeb (Steve Blum) and Kanan (Freddie Prinze Jr.) to head to the planet. As she turns towards the freighter, she watches in disbelief as they destroy the imperials using explosive cargo containers. The Ghost then docks with the YT-2400. Hera, Ezra, Chopper, and Sabine (Tiya Sircar) board a smoke filled ship. They meet the youngster crew, Gooti (Meredith Anne Bull) and Jonner Jinn (Eric Lopez). The hyperdrive is malfunctioning. Hera orders Chopper to help fix it, but he promptly gets into a fight with the ship's scrappy R3 droid. Finally at the helm, they meet Mart Mattin (Zachary Gordon), Sato's nephew and the Iron Squadron leader. Mart arrogantly dismisses their help. He's just crippled a Star Destroyer. Sabine laughs and informs him that was just a light cruiser. Hera commends them for their valor, but says they will be captured or killed if they don't leave the system. The three teens refuse. Ezra pleads that evacuating isn't cowardice. They will fight the empire again in a smarter way. Meanwhile, on Grand Admiral Thrawn's Star Destroyer, he is being briefed on the events at Mykapo. His interest peaks when he's told the Ghost is there. Thrawn orders Admiral Konstantine (Dee Bradley Baker) to investigate, but go in a small ship and do not take many reinforcements. Konstantine is miffed at personally handling the assignment, but dare not refuse an order from Thrawn. The Phantom II docks with the YT freighter as the crew works on the hyperdrive. 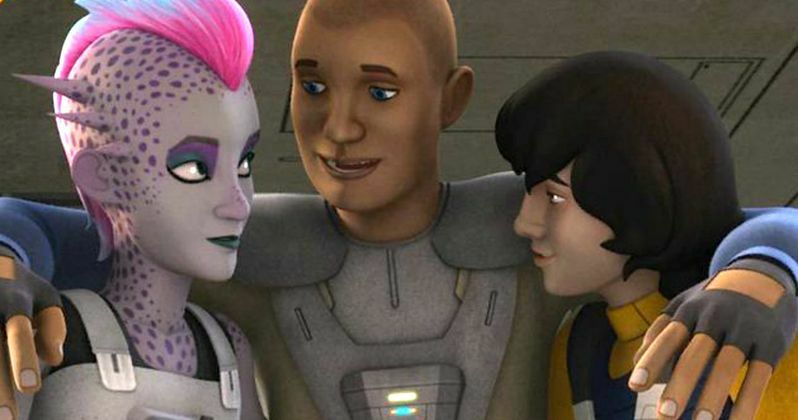 Ezra and Sabine continue to convince Gooti and Jonner that they must leave. The hyperdive stutters to life with a chorus of cheers. It turns to alarm as Sabine realizes the power has been cut and routed to the weapons. They race to the cockpit to find that Konstantine has arrived. Sabine checks Mart again. That's just another cruiser, but more powerful. They race to the airlock. As everyone boards the Phantom II, Mart disengages the ship and stays behind to fight. He valiantly launches his cargo pods at the attacking Imperials. Hera realizes they can't protect the evacuating ships and the freighter. She orders everyone to jump to lightspeed. They'll have to come back for Mart. The YT freighter is taking serious damage, but not destroyed by Konstantine. He orders that a mine be dropped on the ship's hull. He also allows a distress signal from Mart to be sent. At the rebel convoy, they receive Mart's message. Gooti states the obvious. It's a trap, they know the rebels will come back to rescue him. Commander Sato's ship is too far to join the fight. The Ghost jumps back to hyperspace to rescue Mart. As they enter the system, Mart warns them that the imperials put something on his hull. Hera drops R3 and Chopper on the YT freighter. The droids find the mine and deactivate it. They then attach it to one of the cargo containers. Mart makes a run at Konstantine's ship. The Ghost tries to deflect the fire, but both ships are being hammered. Commander Sato and the rebel fleet drop out of hyperspace. They open up a broadside, allowing Mart to disable Konstantine's ship. Stunned, the admiral calls for help, when seconds later Thrawn and his Star Destroyer arrive. Mart is stupefied by the size of the ship. Thrawn coldly introduces himself to Sato. The game is officially afoot. The rebel ships, the Ghost, and the YT freighter jump to lightspeed. Thrawn mocks Konstantine, who claims he was calling for reinforcements, not help. On Atollon, secret base of the rebels, Sato and Mart embrace. The Iron Squadron is now a part of the rebels. The idea that Mart's ship could have held out so long against Konstantine is ludicrous. Even as bait, he could have been easily captured. The situation doesn't make any sense, except for allowing all the rebels to escape. I found the writing to be sub par to previous episodes. Obviously Mart and his hipsters have future roles, as well as Sato's exchange with Thrawn, but the set-up is utterly contrived. Iron Squadron is an inferior episode in comparison to the rest of season three so far, which continues next weekend on Disney XD.